"As wise and appealing as this might sound, it’s actually terrible advice. If you live every day as if it’s your last, you won’t accomplish a damn thing. ... Spending all your waking hours doing only what feels good is a viable life plan if you’re a Labrador retriever, but for humans it’s a blueprint for unemployment, divorce and irrelevance." 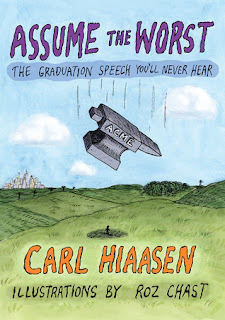 A waste of time, says Hiaasen. "If it requires the psychological equivalent of a metal detector to locate somebody’s true self, then they’re not worth the trouble." "Are you kidding? If you don’t learn how to judge others — and judge fast — you’ll get metaphorically trampled from now until the day you die. ... Your future colleagues will judge you, your future loan officers will judge you and your future spouse’s family will judge you. Get used to it, and tune yourselves to judge back." You get the idea. Hiaasen himself read the audio, making it that much more delightful. Grab this one if you can.